Peonies and Paper Chains: Paper Pumpkin Pretties! Hello friends! As some of you know, I've been a Paper Pumpkin subscriber from the very beginning...and it dawns on me that Paper Pumpkin turns one this month! Happy Birthday, Paper Pumpkin! That's five full card bases, several woodcut embellishments, and plenty of gold glimmer stickers to go! Plus there are the gorgeous shimmery envelope liners and the envelopes, too. I can't wait to create more with the March kit! The Bermuda Bay and Crushed Curry card stock were added into the mix as were all the Framelits cuts, the embossing, banner punches, and the stamps. The little gold glimmer stickers, the wood cut congrats and the striped paper all come in the kit. The card on the right was inspired by the latest Mojo Monday challenge -- such a fun sketch! Both the silver and the gold worked so well! Metallics are very popular these days and adding the ink to the woodcuts was an easy way to incorporate a little more shine and shimmer! These little treat holder tents show off the gold and silver side by side...which metallic shade is your favorite? If you are a current Paper Pumpkin subscriber, I hope you are having as much fun with this kit as I am! If you are not receiving Paper Pumpkin each month, consider giving it a try! ONLY 5 DAYS REMAINING! The last day to receive a FREE set of 2012-2014 In Color Markers is March 31 -- receive the markers free when you become a new Paper Pumpkin subscriber! If you do not currently have a Stampin' Up! 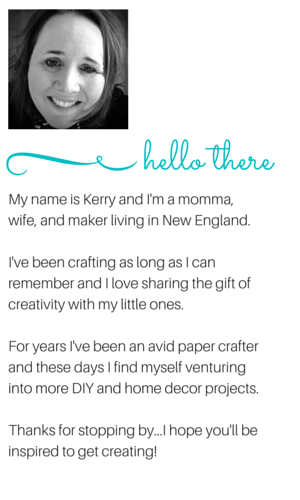 demonstrator, I'm happy to have you join Paper Pumpkin with me as your demonstrator (Kerry Bray in New Hampshire). BONUS: All of my Paper Pumpkin customers receive an empty clear mount stamp box from me during their second month of the subscription and a new box every 6 months thereafter. The box is the perfect place to store your exclusive Paper Pumpkin stamps! This card is such a stark contrast to the Frameltis Dress Up card above and shows you how you can create very different looks from the same set of supplies!